WARNING, 5 HOURS TO KILL ON THE FERRY, IT’S A LONG ONE! Last ride in France today, back to the ferry port in Le Havre. Last night I stayed with Catherine and Claire who I had met through the warm showers website. 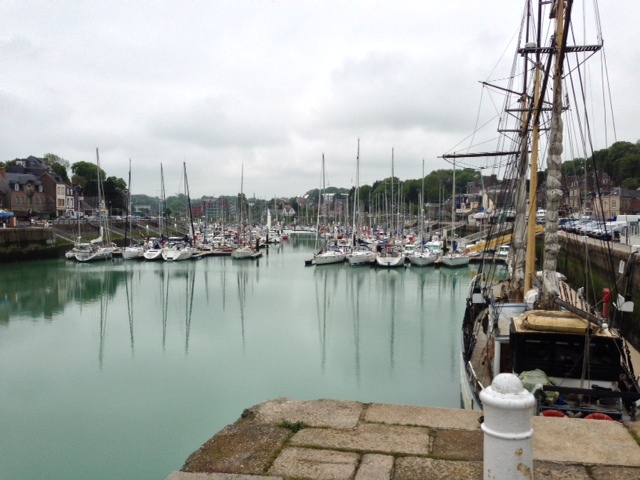 My hosts weren’t home until 10pm so to I took the opportunity to adjust the brakes on the bike, take off the Panniers and head back into Rouen for a sight seeing, beer…. Oh and food. For evening meal I went for the not so healthy option of Steak and Chip Pannini with a 5 x Pain Chocolat washed down with a coke. Not sure how many calories this lot totalled, but a lot…. Even I was surprised that I ate all 5 Pain Chocolat! They were a bargain. 5 (full French Size fully loaded with Butter) for €2.80. After eating all five I’d wished I’d gone for the next deal up, 10 for €5, I’m sure I could have polished off the lot! I got to my hosts house just a few minutes before they arrived, I got back from Rouen pretty quickly without the panniers and beer fuelled. The two pints I’d had didn’t bother to go via my stomach, they went straight to my head after riding 100+ miles  I even forgot to ride on the right at one point until a friendly motorist reminded me. I love the way French motorists beep, they do it with a smile and more often than not just to let you know they are there. Once in doors I had a quick shower, coffee (ah…Good Coffee!) chatted with Catherine and Claire until midnight before retiring to bed. Catherine is a teacher who is retiring soon and said she’d like to ride more but is too old. After a chat we agreed there’s no such thing as too old! I’d explained that my mother had finally quit smoking almost two years ago after being a smoker for most of her life (it took a lot of nagging from me, but I’m proud she’s managed it and kept off them!). Initially when I’d received an email from Catherine explaining they weren’t home until 10pm I was disappointed as I didn’t get the email until late afternoon and considered briefly getting a hotel. I thought about it, then decided no, Catherine and Claire have still offered me (a complete stranger) a bed for the night, it’d be rude to take the easier option (its what I would have done a short while ago). I’m certainly glad I didn’t go for the hotel, even though I was extremely tired it’s wonderful to hear others points and perspectives and something had come up for them meaning they wouldn’t be back until 10, so I turned what would have been a negative into a positive.. A very small step in the right direction. In the morning I had breakfast with Catherine, toast fried egg and tomato. with some special seasoning on, never had eggs like it before. I should have asked what she put on it. Catherine and I left the house at about the same time, after saying thanks Catherine said she was glad I’d stayed and that it was nice to have such a happy smiley person to stay and if I’m in the area I’m welcome to stay again. I’ve never been called happy and Smiley before! Catherine had shown me on a map a more scenic route back to Le Havre via the D66 and D3 and offered to call some friends about 30/40 miles away to meet up for lunch. Unfortunately due to time constraints I decided I needed to keep to my original route. It would have been lovely had I had more time. I worry about being late (for the ferry in this case) and I’d pushed myself with over 88 miles to do with lots if hills and a headwind most of the way. I set off at about 8:30, and headed the wrong way… Why am I not surprised! Wouldn’t be so bad but the wrong way was downhill on a 10% hill. After getting back on the right track I headed out of town after stopping at the first Boulangerie to buy more Pain Chocolat , I think I’m addicted to them. Loaded up with Pain Chocolat (notice the French do not put “au” in between!) I headed out of town via a great big hill. The forecast was for rain again, but I missed it all again, yeah baby!! I was confident that if I didn’t faff and despite the headwind I should make it in time even allowing for a puncture. At times I thought it was tight and was ready to hit the button on the Garmin to “take me straight to Le Havre” but I kept calm and plodded on. I reached the sea town of St Valery en Caux in good time so rewarded myself by stopping for 10 minutes for a couple of Pain Chocolat and a few photos. The route I took was excellent with lots of nice steady climbs with several switchback descents followed immediately with switchback climbs. They’d make a great club weekend, overnight ferry, ride for 1-2 days then ferry back. 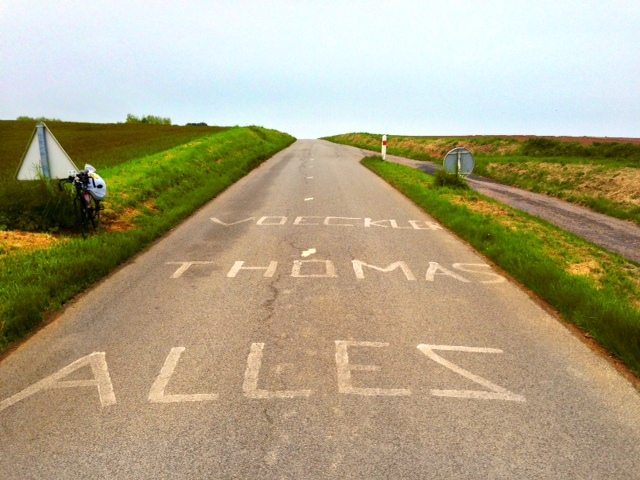 Just after one of the Switchback climbs just before the crest there was writing on the road, “Tour de Vive” and “Voeckler Thomas Allez”. I had to stop and take a photo. Several times on my ride through France I came across spray painted cycling route information. Most commonly “BPO” followed by an arrow. This would be written on both sides of the road so cyclists in a peloton on either side would see it. I must search google for BPO. 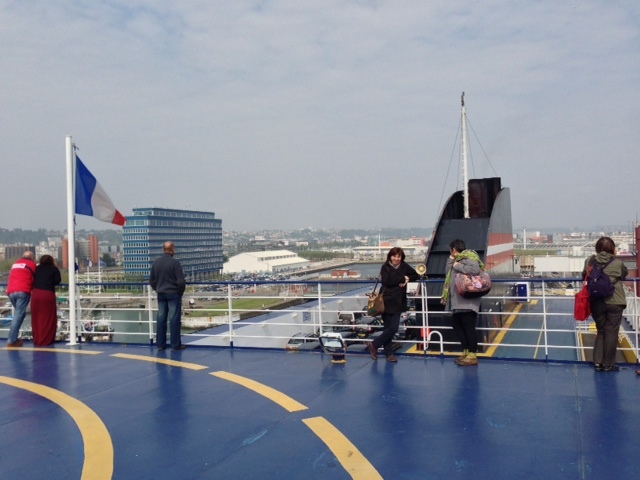 The last stretch into Le Havre was nice flat very smooth Tarmac. My mileage average speed splits were the best they’d been all day…. until I saw the Golden Arches… McDonalds! I veered off course and indulged. The way you order in a French McDonald’s is different, to quote one of my favourite films “it’s a little different”. They have self service machines, you put your card in, select English (if your school French isn’t good enough). Then proceed to make up your order. Stick your PIN number in and take a numbered ticket. Just like Argos, you collect when your numbers up. It’s great but it doesn’t force you to learn how to order in French. McDonald’s in France is a lot less busy than I’m the UK, hardly surprising when my order of large Wedges (ought to do these in England), big burger (can’t pronounce what it’s called, it wasn’t Le Big Mac! ), large coke and a Le McFlurry was €11.50! with the current exchange rate that’s about a tenner! I arrived at the ferry in good time despite my worrying. after checking in I went through security, the elderly chap in front with a walking stick was being given a hard time by the French Police, having to hobble around and take all sorts out of his car for inspection. When it came my turn I was expecting the same, but the official just asked me about my bike, how far id rode, smiled and let me on my way. I joined the motorbike/cycle lane waiting to board. Unlike the UK, the French care about those open to the weather. The lane for motorcycles and Bicycles was covered on a sides to keep you dry while waiting. In the UK your open to all the elements. I was loaded onto the ferry efficiently, secured the bike, removed the luggage and headed for the shower, more beer then Curry and chips, including more beer! Before I’d left for this trip I’d not paid much attention to the details as I had a lot going on but realised a couple of days ago that the ferry coming back into Portsmouth arrived at 21:30, not 04:00 which for some inexplicable reason I had in my head. That’ll explain why I’d originally packed my head torch which is removed before departure. I sent my Aunt and Uncle in Portsmouth a message to ask if they would be so kind as to let me stay Friday night. Luckily they said yes otherwise I’d have been riding through the night with the front light off until I saw a car (only has 3-4 hours charge at lowest brightness). That’s why I’d packed the head torch that I took out do I could ride straight home. Hopefully I should be back in Devizes tomorrow around 13:00 or earlier in time for a beer or two at the Devizes & District Gentlemen’s Club and to be able to drop my bike off at Bikes & Boards as the back brake stopped working on one of the last downhills into Le Havre. The emergency stop I had to do to avoid going up the back of a Mercedes probably didn’t help. When they work, disc brakes are great!! They stopped me dead when the car in front stopped, I was about an inch off his bumper (I admit it would have been my fault, I was faffing with the Garmin).